Le Coucher du Soleil is a former barn within the grounds of an English owned Charentais Farmhouse now beautifully restored to provide a superb Gite for couples. Featuring a beamed lounge with wood burner, English TV, well equipped kitchen/diner and a king sized bed upstairs with ensuite shower room, the Gite has its own dedicated Wi-Fi, private parking and enclosed garden and patio with bbq, table & chairs and sun loungers. Bikes,boule and of course the heated 8x4 swimming pool and table tennis are available for guests to use (at own risk so a disclaimer must be signed). Mansle which has shops, markets and restaurants is about 4 miles away. The area is perfect country for cycling, walking, bird spotting exploring or simply relaxing with a glass of wine in the garden. Please note that the rental prices shown in the 'Rates' section are inclusive of a 'Tourist Tax' of 0.40 cents per person,per night. We are relatively new to France, having moved here in 2017. We have grown up children and also grandchildren in England. We last lived in Cornwall but find this to be quite busy now compared to where we now live in France. I, Harry, am a registered social worker and Diane is a registered nurse. We wanted a house in France that was far enough away from the UK to be 'typically' French and offered a good climate, good food and wine. The Charente is a beautiful area - we just never get tired of the views we are so lucky to have. The night skies are staggering -with no light pollution, its an astronomer's dream. It was important that there were good communication links -we are close to the N10 which is the main route down to Spain and Portugal, we are served by two airports - Poitiers and Limoge with Ryanair offering cheap flights to and from the UK. Of course we also have the TGV - Paris is only 2+ hours away. Our house is in a very rural area but only a few miles from the nearest town (Mansle). It's just perfect - hopefully you will find out for yourself! As we live here full time we get the benefits of seeing the seasons change the landscape -this year the farmer planted sunflowers in the field opposite our house -they were beautiful. Guests staying in our gite are able to use the heated swimming pool, use our bikes (at own risk so a disclaimer must be signed) - it's perfect cycling country or just chill out in their own private garden -it's all about relaxing. The gite has it's own parking to, so no security worries - not that crime is ever an issue in the Charente! Above all, we want to offer guests a memorable holiday experience -judging by the comments left in our guest book, we think we have just about got it right! En-suite shower room with shower, washhand basin and toilet. The ground floor features an original oak beamed ceiling, spacious lounge/diner and kitchen. Wood burning stove, wall mounted electric heater,Satellite TV/DVD player, CD player/radio, books, , DVDs and games. There is a dedicated WiFi system in the Gite. The kitchen is fitted with cooker, microwave, washing machine and fridge. Plus all the kitchen equipment you would expect. Lots of CD's to listen to. There is also an I pod docking station and Bluetooth speaker. Lots of DVD's for you to choose. Large private garden for Gite guest's own use. You can hire a kayak at nearby Mansle and explore the Charente river. We can lend you two bikes free of charge subject to signing a disclaimer. The area is great for cycling! There are golf courses near Angouleme and Cognac. Please contact us for further details. The heated swimming pool is shared with the owners but there is never a problem with access . Notes on accommodation: The Gite is not suitable for children, babies only-sorry. Outside: Outside you'll find a patio table and chairs, barbeque and sun loungers. There is also a heated 8x4m swimming pool with Roman steps and security fence which guests are welcome to use. There are also ladies and gents bikes available (foc, but as with all activities a disclaimer must be signed) and table tennis. Please note: the swimming pool is open from May until the end of September or longer depending upon weather. Cleaning / Towels / Linen Towels including 'pool, linen and service costs eg. electric, water etc are included in the weekly rental. Other: The theme in the bedroom is French with just a hint of the Orient. The King sized bed lies under an impressive original oak beamed ceiling. Peaceful location with good access to various destinations across the Charente region. Fantastic hosts who really cared about our stay being as good as it could be. 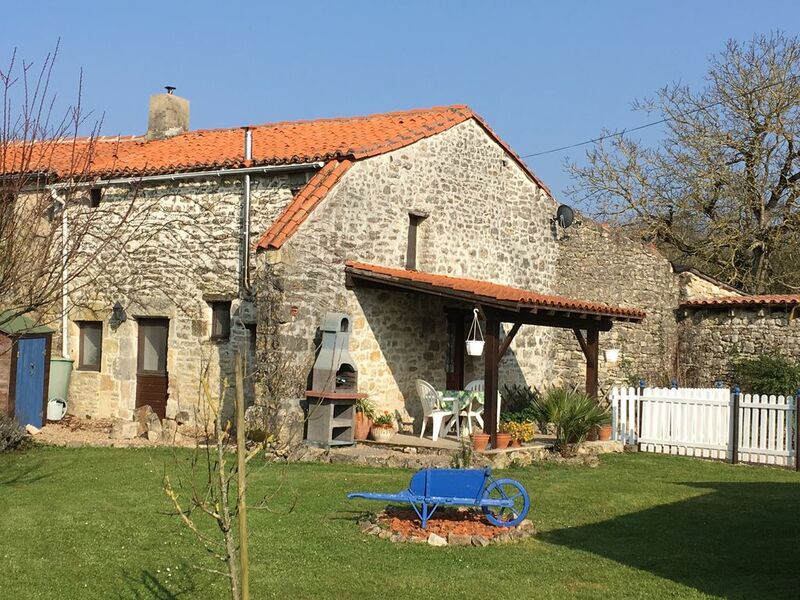 Very well equipped gite with everything you need for any length of stay. The swimming pool was fab, no need to worry about it being cold..!! Bikes are available to use which is a great way of exploring the local countryside. Good location to access the surrounding region with many places of interest within reach via the N10. Mansle is the nearest place for supplies/fuel and has a great restaurant/pizzeria that is worth a visit. Peace and tranquility in this lovely Gite. We stayed for 9 nights from 26th July to 4th August 2018 having driven from the busy resort of Lake Garda in Italy. The Gite was all that we hoped for as it was very well equipped and in a lovely location. Harry & Dianne Ivey were very welcoming and greeted us with a welcome pack which included a bottle of wine. The swimming pool was a nice bonus as the weather, at the time, was very hot. We recommend this for a couple looking for a relaxing holiday in the beautiful Charente region of France. For a week we had the most relaxing time thanks to our lovely helpful hosts.The gite was spacious and the vast bedroom, the king size bed and the peace and quiet allowed us to totally switch off and recharge our batteries after a long year. Susan and Keith did everything to make our stay memorable with their bikes,lovely tomatoes and of course the swimming pool.The only shame : that our stay was not much longer ! Great hosts. Beautiful gite for two. Loved it all. Weather superb and great sky's at night. Mac and Zac the dogs are lovely and friendly. Gite in good location to travel various places . Prima vakantiewoning voor twee. De woonkamer is wat donker maar wat maakt dat uit uit als je de hele dag buiten kunt zijn. Alles is in het huis aanwezig . De koelkast heeft wellicht zijn beste tijd gehad qua koelkracht . Een mooie slaapkamer boven met een ventilator die bij warm weer goed van pas komt. Harry en Diane zijn heel hartelijk en gastvrije mensen. Het is er heerlijk rustig en je kunt goede plek vinden in zon en schaduw . Bovendien een mooie barbecue en een goed zwembad waarvan je gebruik kunt maken. De afstand naar Masle en Fontenille is niet ver. Ett trevligt hus med ännu trevligare värdpar! Vi hyrde huset 10 dagar i juni. Huset var lagom för två personer, det ligger i ett stilla jordbruksområde. Trädgården var mycket fin likaså den lilla poolen. Värdparet Diane och Harry var så vänliga, de hjälper med allt man kan tänkas behöva. Det underlättade för oss att de är britter för vår franska är rejält knackig. The Atlantic coast with its truly magnificent beaches is about 2hours drive away with La Rochelle perhaps being the most well known town. The nearest airports are at Poitiers and Limoges. Ryanair fly there from Stansted, East Midlands and Edinburgh plus other UK locations during the holiday season including Newcastle.FlyBe also fly into Limoges. Poitiers is about 55 mins drive to the Gite and Limoges just on the hour. .The nearest ferry port is St. Malo -about 4 hours drive. A car is essential. Car Hire is available at local airports. For the adventurous there is canoeing at Mansle, (approx 3 miles). Angouleme with its beautiful architecture, famous annual comic strip festival and vintage car race is only 25 mins drive. Cognac with its historic distillery houses and Blues Festival (held in July) is about 40 mins drive. Ruffec is about 20 mins drive. There are supermarkets, boulangeries, banks and daily markets selling wonderful produce at Mansle, Ruffec and Angouleme. There are some superb restaurants to cater for all tastes and budgets - all within an easy drive. Canoeing on the Charente is available at Mansle. There is a velorail near Confolens which is great fun. Lots of historic villages and some wonderful churches. Booking Notes: Please note that standard rates apply to any dates outside of the seasonal periods stated. In the first instance contact the owner. You will be sent a booking form via e-mail, complete and return the form together with a 10% deposit. The balance is payable 8 weeks prior to rental period. Payments are accepted electronicaly in Sterling. Changeover Day: Rental periods are normally from Saturday to Saturday unless by prior arrangement. Arrive 4.00pm, leave by 10am on day of departure.